By the start of the nineties, the name Rolex had become inextricably linked with notions of success and achievement. While there are some that give the company’s marketing department the lion’s share of the credit, the brand’s faultless public image had been established first and foremost on the back of an exceptional range of products. What had made Rolex stand apart from other luxury goods makers was its overwhelming focus on quality. When you bought a Rolex watch, you were aware you were buying something very special; a piece of engineering excellence that was going to outlast you and be passed down to subsequent generations. From an economics standpoint, it was a vastly different strategy from other vendors of high-end items. While slick advertising might convince you that you needed a certain type of car or a more powerful computer, such companies were reliant on customers replacing their products at a relatively high frequency. It all helped keep the wheels of production turning. Rolex is different; from its origin way back at the start of the 20th century, its focus, or its obsession might be more accurate, was to build watches that lasted as long as possible and were as good as technology allowed—and if that wasn’t good enough, they would take it upon themselves to invent new technology. The result was, when a customer acquired a Rolex watch, they were also getting a pedigree that went far beyond the monetary value. They were buying a product that was manufactured without any form of compromise in its construction, with little or no concession to the fickleness of fashion, and something that would accompany them through the major milestones in their lives. It gave people a genuine emotional connection that was unlike practically any other luxury product. So it was ironic that, after the disastrous effects of the quartz crisis, it had taken the absolute antithesis of those exact values to rescue the Swiss watchmaking industry. The Swatch, a cheap, trendy and above all, disposable watch, encapsulated everything Rolex was not. Nevertheless, it had sold, and continued to sell, in its millions, pouring desperately needed funds back into Switzerland. The Swiss had beaten Japan at its own game, using a quartz watch to end the quartz crisis and giving traditional firms the budgets to create pieces that made people fall back in love with the artistry and craftsmanship of mechanical watches again. While Rolex had dabbled in quartz technology, their focus was still very much on the watchmaker’s art—using decades of expertise to keep its range of classic timepieces at the pinnacle of what was possible with gears and springs. The nineties saw the introduction of an all-new watch from behind the velvet curtain of Rolex HQ, an event as commonplace as spotting a unicorn in the wild. And it was also the decade that saw the end of one of their greatest and longest-serving creations. 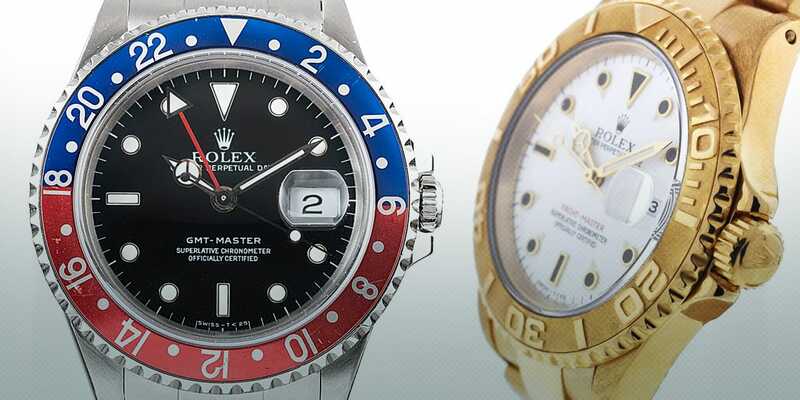 Below, we’ll highlight the most popular Rolex watches of the 1990s. There is an unconfirmed story, as the vast majority of stories about Rolex tend to be, that the original Yacht-Master came into existence because the company decided to completely revamp the look of its most beloved and successful design, the Submariner. After working on a modernized version of the world’s favorite dive watch for an unspecified length of time in the eighties, senses were finally come to and the plans to replace it were scrapped. However, the new watch the team of Swiss boffins had come up with was deemed too good to leave on the shelf, and it was decided to release it as a completely separate nautically themed piece, unapologetic in its luxuriousness. Why Rolex would ever choose to replace one of horology’s first real icons has never been properly explained by the rumor mill, and if it was ever a genuine notion, it was not, thankfully, one that stuck around for long. What is in no doubt is that 1992 saw the appearance of the first all-new watch to emerge from Rolex since the Daytona was launched in 1963. Of course, in this case, the term ‘new’ was stretched to near breaking point. When the Yacht-Master made its debut, its similarity to the Sub was evident to pretty much anyone blessed with the gift of sight. Its lines were somewhat softer and more rounded, and its all gold construction underlined its status as the deluxe version of the tough-as-nails tool watch. Water resistance of 100m as opposed to 300m, and a gold bezel that rotated in both directions further cemented the Yacht-Master’s rightful place as above the waves rather than below, but otherwise, the two watches shared a caliber, the Cal. 3135, along with identical hands and dials. Although it has never matched the incredible appeal of the Submariner, which is a statement that applies to just about every watch ever made, the Yacht-Master has remained one of Rolex’s most popular designs and one that neatly sums up the prevailing spirit of the post-quartz crisis nineties. Unwilling, and unable, to compete with electronic watches on price and accuracy, the Yacht-Master continued Rolex’s advance in the opposite direction. High quality mechanical watches, while still extremely impressive in terms timekeeping precision, were now more likely to be worn as symbols of advanced status and outward expressions of accomplishment. This new addition had no allusions to be anything other than a beautiful timepiece designed to catch the eye while lounging on deck or strolling through the privileged environs of the yacht club. It also became the first of the Oyster Professional range to be made available in three sizes, with a mid-size 35mm standing alongside the ladies’ model and the full-size 40mm. Today, it continues in the same luxurious vein, with precious metal-heavy versions in 40mm and 37mm, and bezels made from gold and platinum or Rolex’s ceramic compound Cerachrom. Whatever the tall tales as to its origin, the Yacht-Master has proved itself worthy of its place in the Rolex canon; and for lovers of the all conquering Submariner, we can breathe a sigh of relief that the original is still very much alive and kicking. The long, illustrious, yet confusing history of Rolex’s flagship aviator’s watch took another turn at the end of the nineties, when the last of the GMT-Masters bowed out, leaving the GMT-Master II with the playing field all to itself. Uniquely, the two series’ had run concurrently since the introduction of the Fat Lady in 1983, with the ref. 16760 debuting as the first model of the new range. While it’s often quoted as the being the watch that introduced the Quickset GMT hand feature, the major defining difference between the two groups, it was a previous reference of the original GMT family that holds that distinction. The ref. 16750 had been the watch to uncouple the 24-hour hand, allowing wearers to set a new time zone independently. The 16750 had said its farewells in 1988 to be replaced by the ref. 16700, the last chapter in a story that went all the way back to 1954. The link between the GMT-Master and Pan Am is well known, as are the varied nicknames for its run of two-tone bezels. The initial blue and red color scheme was instantly christened the Pepsi; a functional as well as an immediately recognizable aesthetic stamp, it differentiated between the night and daylight hours as transcontinental travelers crossed time zones. Following it, the black and red bezel quickly became known as the Coke, while the brown and gold surround garnered its moniker of the Root Beer, or alternatively, the Clint Eastwood. Unkindly likened in some quarters to the kind of upholstery usually found in 1970’s caravans, it was something of an opinion splitter. The ref. 16700, the last of the original GMTs, seemed reluctant to be accept retirement and, for a watch at the end of its run, said a surprisingly long goodbye. Starting out in 1988, it eventually ended production in 1999. Made in much smaller quantities than the GMT-Master IIs of the same era, it was nevertheless a popular reference with fans, benefitting from near identical looks but with a more affordable price. Rolex updated its movement to the newer Cal. 3175, which introduced the Quickset and hacking features, proving it wasn’t a watch to just go gently into that good night. Along with an upgrade in caliber, the 16700 also became the first of the pioneering series to be fitted with a sapphire crystal. Even so, the GMT-Master was definitely winding down. Although it was given a new, slimmer profile, its case was only ever forged in steel, while its soon-to-be replacement was starting to appear in 18k gold, both yellow and white, from the depths of Rolex’s own foundry. 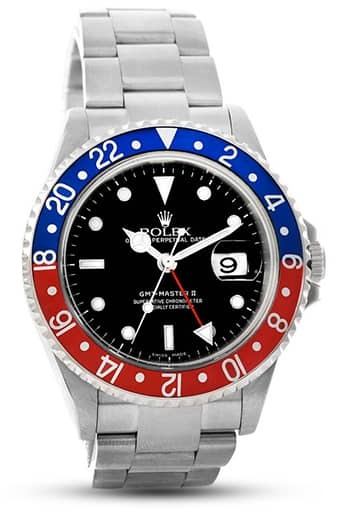 Moreover, the 16700 came with just the Pepsi bezel, a classic look to end a staggeringly successful 45-year run. At the end of the decade, Rolex stopped production and left the GMT-Master II to hold the distinction as its main pilot’s watch. While it has gone on to enjoy major upgrades itself, with Cerachrom bezels and evermore sophisticated internal mechanics, the original references have become increasingly revered as vintage purchases—a surprisingly attainable gateway into Rolex collecting for such an emblematic creation.